Today we tacked one the most difficult routes in France, the route from the La Marmotte Sportif (a 10,000 person race the first Saturday in July). We left Annecy at 6:30 am and drove to Bourg d'Oisans at the base of Alpe d'Huez (one of my favorite towns in France). After a wonderful breakfast of pain au chocolat (chocolate croissants) and coffee we headed out to tackle the Col du Glandon from the south. 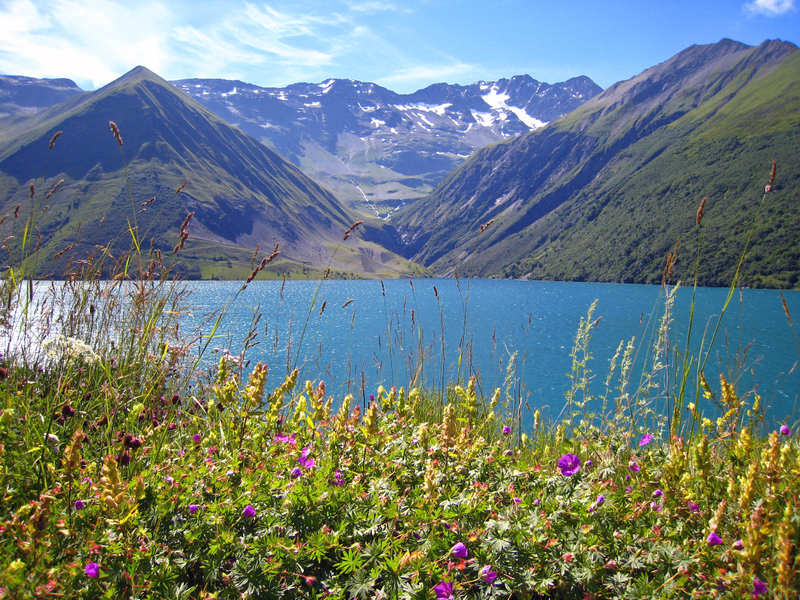 This is a very long and difficult climb (nearly 20 miles), but there are some stunning views that make the climb easier. After nearly 2 hours 20 minutes of climbing we summited the Col du Glandon, took some pictures, and then headed down the other side on what was one of the most fun descents I've ever had. As the following picture shows the top is very steep and technical, but it was a lot of fun! It was here that I hit my top speed for the day, 49 mph. We stopped for lunch in a little village on the descent on the Col du Glandon - I had a pasta Bolgnaise that was not the best meal I've ever had in France, but it certainly gave me the calories I needed for the rest of the day. After finishing the descent of the Col du Glandon we turned right and rode about 15 miles up the valley towards the base of the Col du Galibier. 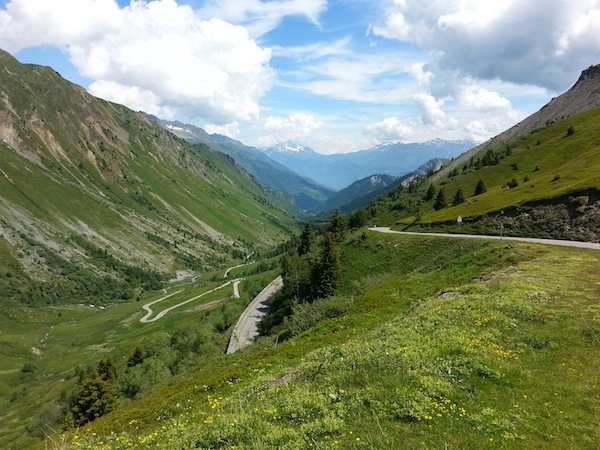 The Col du Galibier is technically two climbs, the Col du Telegraph, followed by a brief descent to the quaint ski town of Valloire, and then the Col du Galibier itself. In total both climbs are 35 km long, or 21.7 miles, climbing more than 6,000 vertical feet between the two in those 21 miles! 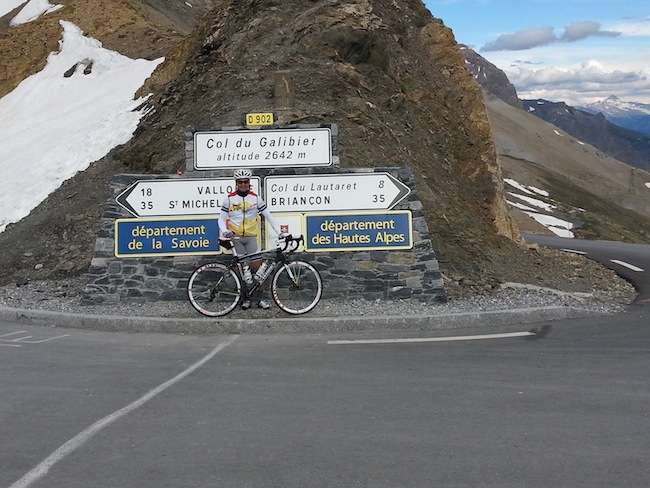 The Col du Galibier is the second highest pass in France and it is often featured in the Tour de France. I'm embarrassed to say how long it took me to ascend the Col du Telegraph and Col du Galibier - let's just say that lunch didn't agree with me and it was really a struggle for me up these difficult climbs. Bryan was kind enough to ride with me, but I could have used another two gears to spin faster, particularly at the top of the Galibier. The following pictures show yours truly at the summit and the view towards the direction we descended. Yes, the road plunges quickly down the side of the mountain. And here's the view back towards the direction from which we ascended. 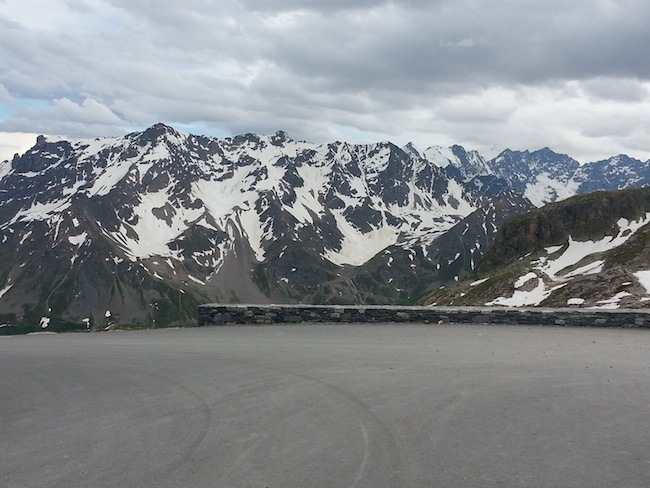 This has got to be one of the prettiest mountain passes in France, and it's certainly the prettiest I've seen. 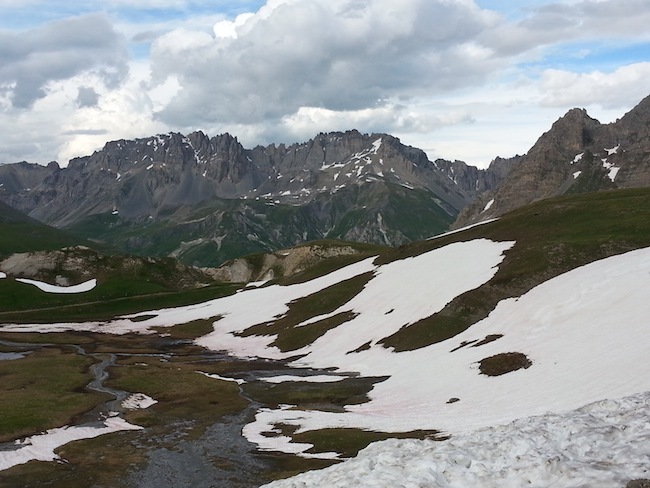 Note the amount of snow, the result of a very cold and wet spring in the Alps this year. In total we rode just over 101 miles and climbed more than 13,000 vertical feet. We didn't set any land speed records but this is by far the most epic day I've had cycling in France. The screen capture below shows my computer data from this unbelievable ride. PS. Had we completed the La Marmotte route we would have finished with a climb up the infamous 21 switchbacks of Alpe d'Huez, adding another 4,000 vertical feet in only 9.3 miles. Perhaps that's something for another day? Sweet! Thanks for finally sharing some photos to prove you are there.... unless that is a fake backdrop... Enjoy - looks like fun...at least the downhill parts! Beautiful ride, Jonathan. Thanks for the post. What gearing are you riding? Matt, I'm riding a compact, so 34-25 - I could have used at least a 27, maybe even a 29.